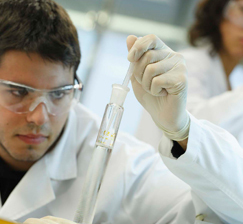 As part of its mission, IBEC aims to inform society about the research being conducted by its scientists in bioengineering and nanomedicine, both to help citizens understand the importance of research and make informed decisions, and to encourage young people to consider scientific careers. 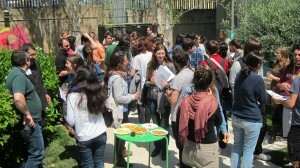 The institute organizes or takes part in a range of dissemination activities throughout the year. These outreach activities are coordinated by the Communication and Outreach Department at IBEC, with direct collaboration with researchers from all groups. Together they also develop materials for students and teachers to help explain certain concepts and methods. School visits comprise a general overview of IBEC, a presentation of some of the research activities carried out by IBEC groups, visits to laboratories and hands-on activities or experiments, such as rapid prototyping with the help of chocolate, atomic force microscopy using a roller skate, or teleoperation to control a robotic hand. 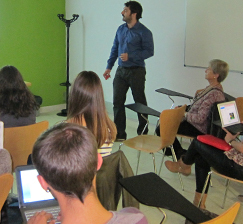 | Teachers: Contact ibecdivulga@ibecbarcelona.eu if you’d like to bring your class for a visit to IBEC. IBEC participates in annual fairs and exhibitions aimed at presenting the research that is conducted at universities, research centres, enterprises and other organizations, promoting science and technology, or giving advice and information to young people wanting to pursue a career in research. 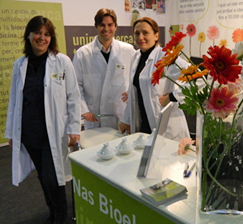 These include ‘Recerca en acció’ at Barcelona’s Saló de l’ensenyament education fair; the Fira Recerca en Directe, organised by the Parc Científic de Barcelona (PCB) and supported by l’Obra Social de Catalunya Caixa; the Festa de la Ciència, and Nit Europea de la Recerca. >> IBEC appears in a Fira de Recerca en Directe video (from minute 01:04). 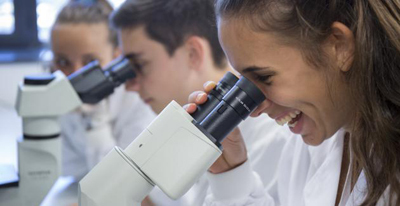 Within the Programa Joves i Ciència de CatalunyaCaixa, IBEC promotes scientific vocation among school-age students by offering the placements in labs and the chance to develop a research project over several weeks during the summer. In this initiative, organised by the PCB and Catalunya Caixa, an IBEC researcher is assigned as a tutor to secondary school pupils who are starting their A-level/Baccalaureate research projects. | For more details, visit the PCB website. Fundació Catalunya-La Pedrera’s Science Teachers’ Programme invites secondary school teachers to participate in courses at scientific research centres, allowing them direct contact with laboratories and researchers to enable them to bring current research into the classroom. | Visit Fundació Catalunya-La Pedrera for more details. 2018 will be the first year that IBEC takes part in Bojos per la Ciència (Crazy about Science), the Fundació Catalunya-La Pedrera initiative that aims to encourage scientific vocation among high school students. First launched in 2013, the programme offers courses – held on a series of Saturdays throughout the year – to selected high school students who show aptitude in science. The theoretical-practical sessions taught by researchers at the participating research centers, which include IRB, CREI, ICN2, ICIQ and more, cover topics such as biochemistry, biomedicine, economics, physics, food, mathematics, nature, new technologies and chemistry. IBEC’s course on bioengineering will introduce students to the multidisciplinary environment offered by the field, where different disciplines come together to solve health problems. Each of IBEC’s groups will provide one of the 21 sessions, during which the students will find out about the controlled release of drugs, biomaterials, regenerative therapies and the medicine of the future, among other topics. They’ll also be able to take part in complementary workshops dealing with ethical questions or that provide specific training in the environment of a research laboratory. The course will be held on Saturdays from January 20 to October 20, 2018 at IBEC, as well as at other collaborating centers such as the Hospital Clínic de Barcelona, IDIBAPS and the Diagonal Besòs Campus of the UPC. | Visit the webpage for more details. 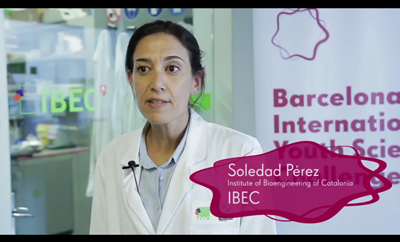 IBEC takes part in the Barcelona International Youth Science Challenge (BIYSC), an initiative that aims to stimulate scientific talent among undergraduate students aged between 16 and 19 from all over the world. IBEC’s researchers contributed to the first edition with the project “Instructive Biomaterials for Regenerative Medicine” (see video, left), coordinated by Biomaterials for Regenerative Therapies group senior researcher Soledad Pérez. 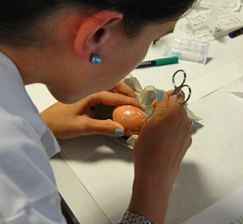 The project aims to help the students understand the basis of regenerative medicine and to find out about developing of target-specific biomaterial scaffolding systems and was one of ten that was offered by research centres in the area within the framework of the first BIYSC, and one of four that was fully subscribed. As well as the lectures from leading scientists, BIYSC’s calendar of events offered debates and discussions with the directors of international research centres, including IBEC’s director, Josep Samitier; visits to those centres; the chance to work on the project in a lab; and many social activities. Biomaterials for Regenerative Therapies group leader Elisabeth Engel gave a talk, “Biomaterials, beyond a simple template” at Mon San Benet as part of the lectures schedule of BIYSC, and nine students came to IBEC in July to start the hands-on part of the project. In 2015 we organized the first open day aimed at university students. The goal was to provide an opportunity for them to meet IBEC researchers and discuss the issues to take into account when considering a research career in the field of bioengineering. Students were able to tour the facilities of IBEC and meet members of each research group, who explained their research. In 2015, in collaboration with the IRB, we organized a open day especially dedicated to introducing science to young children. Children between 3 and 12 years old – mostly the children or nieces and nephews of IBEC staff – enjoyed a scientific play and then a tour of the IBEC facilities. They were also able to participate in a range of workshops aimed at demonstrating science in a fun and hands-on way. In the context of the Semana de la Ciencia, we offer an annual open day for the general public. The day comprises a scientific talk of social interest, allowing the public the opportunity to find out about a particular area of research being carried out at IBEC and how the institute works. They can also visit the laboratories of IBEC and see our lab environment for themselves. In 2013 IBEC received funding for an outreach project from the Fundació Antigues Caixes Catalanes (formerly Unnim Caixa) of the BBVA. The prize funded the unit’s successful proposal for a series of scientific talks on nanobiotechnology, robotics and tissue engineering which were held at libraries and civic centres in Barcelona in Oct-Dec 2013. In 2014, IBEC signed an agreement with the Ayuntamiento de St. Feliu de Guíxols to work together on a new museum exhibit on the history of health and medicine in Catalunya, “Curar-se en salut”. The exhibition was inaugurated at the Museu d’Història de Sant Feliu de Guíxols in November 2014. | “Curar-se en salut” video about personalised medicine. 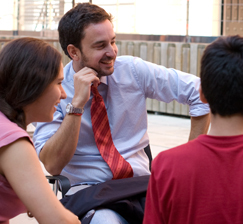 Short meetings are arranged between high school students and young IBEC researchers or PhD students, during which the pupil can ask questions and learn more about a research topic or area of science. | Contact ibecdivulga@ibecbarcelona.eu for more details. Independently or in collaboration with other bodies or within the framework of established events, we organise scientific talks, fairs, visits, workshops and other events. | To organise any type of activity with us, please contactibecdivulga@ibecbarcelona.eu. This year, IBEC has developed some high school teaching materials in collaboration with the CESIRE-CDEC and with the support of FECYT. 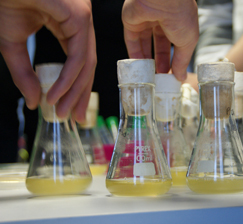 With these materials, teachers and students can carry out research work in biotechnology without leaving the classroom. It is designed to guide students through their first steps in research, helping them develop a question to answer and an experimental protocol to discover what is behind natural methods of conservation. | You may request the teaching materials at ibecdivulga@ibecbarcelona.eu. IBEC has Memoranda of Understanding with several other organizations to carry out outreach activities together.